Rahul Sidhu is the CEO and Co-founder at SPIDR Tech. Raul has always taken public safety, data and artificial intelligence seriously. Now, he's found a way to do all three through SPIDR software. 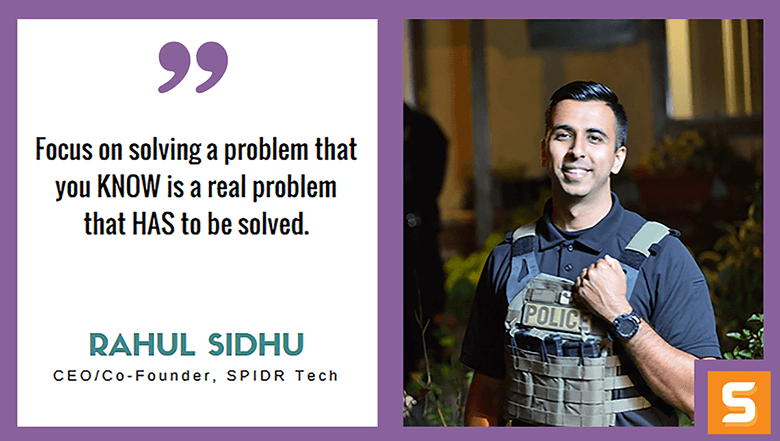 In this interview, Rahul explains how he built SPIDR software to be a platform that solves data fetching problems on Police Patrol levels. He envisions, as a former police officer, that SPIDR will help every officer in automating police-community relations using modern technology. His biggest piece of advice to aspiring techpreneurs - Focus on solving a REAL problem and BE REALISTIC on your approach to solving it. Learn more about Rahul's entrepreneurial journey and how he started SPIDR Tech below. Afterwords, be sure to give him a shoutout on Twitter! How did you get the idea for SPIDR Tech? Is there something you wanted to do different or better than your competitors? Well, the original idea came to me while I was working as a police officer. I was actually riding along with another police officer I knew from the academy (at a different department), and he and I were talking about how frustrating it was to analyze and share data at a patrol level. That said, that idea had transformed dozens of times since then and we finally decided to focus on improving police-community relations using data and modern technology. With our current product, we don’t really have any direct competitors per se. We built the world’s first community relationship management (or CRM) platform for law enforcement and it’s truly one-of-a-kind. Think Salesforce, but for police departments and with an emphasis on ensuring accountability, transparency and engagement for the communities they serve. That said, most of the industry is built around long-standing incumbents that have focused less on innovation and more on corporate efficiency over the years. Aside from 1-2 other venture-backed startups in the space (special mention to Scott Crouch and Mark43), we’re different from our competitors just by building on modern technology and utilizing contemporary pricing, support and business development strategies. But in the end, it’s our product that separates us from the rest of the companies in our space. In the coming years, I fully expect to see a total embrace of community relationship management. As departments around the country are spending money to figure out how to improve their police-community relationships, we plan on showing how much more effective and efficient it is to use modern technology to automate the process of citizen engagement. Just like almost every sales department in the country utilizes a customer relationship management tool, I envision that every police department in the country will utilize a (more specifically), our community relationship management tool. What attitude/habits helped make you successful while starting SPIDR Tech? I wouldn’t classify us as successful just yet. That said, I think two of the most important things to ensuring future success for us are proper communication and agility. Communication within our team (and with our customers) is incredibly important. Ensuring that the entire company communicates effectively is not something that happens overnight. It’s not just about transparency or horizontal structuring, it’s about having processes in place to ensure that you’re closing the communication loop amongst the product team, the sales team and leadership. Agility is important for any startup. At an early stage, you have to be fast and you have to be flexible. Identifying product market fit isn’t easy when the barrier to entry is high (as is with law enforcement). For us, opportunities to make a difference for customers were often limited at early stages, so we had to be fast enough to take advantage of them and flexible enough to turn on a dime when necessary. I did but I never actually showed it to investors. It was more of an exercise for me to be able to answer my own questions and force myself to diligently do the research required in the beginning. Our product and market approach has changed so many times since I ironed out our first business plan that it really just came down to managing our numbers and experimenting until we got it right. There’s a fine line between sticking to something you put on paper because you’re too stubborn or afraid to make changes, and being all over the place with little to no direction. Building too robust of an MVP (minimal viable product). We spent way too much time building out a comprehensive product that did everything our customers could have imagined right out of the box, only to find that the deployment took way too long and we couldn’t scale it the way we thought we could. We were truly convinced at the time that we couldn’t make a leaner MVP and this was the fastest/best way to market. Wrong. It wasn’t until we were backed into a corner and time was against us that we had to go back to the drawing board and come up with a significantly leaner/faster approach. We learned this lesson later than I wish we did, but I’m glad we learned it before it was too late to do anything about it. No, it was a fairly easy process with the right legal assistance. We did everything the typical startup way (Delaware C-Corp, etc). We didn’t try any of the template creators or legal service farms. We had an attorney that gave us a good deal on our initial package. What makes SPIDR Tech unique from others? How did you find your competitive advantage? Our product, SPIDR Engage, is a first for law enforcement. We’re solving a problem that you see on the news every day. It’s a problem that local, state and federal government agencies are spending lots of money on trying to solve in creative, and sometimes ineffective ways. The difference is that we’ve recruited the brightest minds from around the country (ivy league engineers, public safety industry CEOs, police chiefs, federal CIOs, etc) and we’re solving it at scale. Many of us come from the world of law enforcement and we’re constantly frustrated with what we see in the news. We want to put what we’ve built in the hands of police departments around the country (and eventually, the world) because we know it’s so desperately needed. It’s not that police departments don’t want to improve their police-community relationships, it’s that they are having a hard time doing it with the resources they have. Honestly, what it comes down to is an obsession with solving the problem. If I could spend my life meeting every citizen in the country so that I could improve the way they interact with their local police department, I would. The closest thing that I can do personally, is to build and sell technology that can do that at scale, and that’s what we’re doing. We use QuickBooks, Expensify and Gusto for our finance stack. We also outsource a lot of our CFO work to outside consultants. Well for California specifically, I would tell them to put some thought into headquartering in Los Angeles. It’s a rapidly growing tech scene and you have the opportunity here to be a big fish in a small pond that’s getting bigger every day. But for anyone who wants to start a company, I would say this: Focus on solving a problem that you KNOW is a real problem that HAS to be solved. The caveat to that is that you really have to put a lot of effort into understanding what that problem is and being realistic about your approach to solving it. After that, the only thing that truly matters is execution.